The Tenerife Experiment consisted of three small double-antenna radio telescopes that carried out observations at 10, 15 y 33 GHz from the Teide Observatory, Tenerife. In 1994, the discovery of the "thermal footprints" in the fossil cosmic microwave radiation reforced the "Big Bang" theory. This radiation corresponds to light emitted some 300.000 years after the "Big Bang" (almost 14.000 millon years ago) and represents a "snapshot" of the state of the primordial Universe, when it was much hotter and compact. The instruments are examples of a Dicke Radiometer which function using a rapid switching between two horns to measure directly small temperature differences and eliminate fluctuations in the amplifiers. 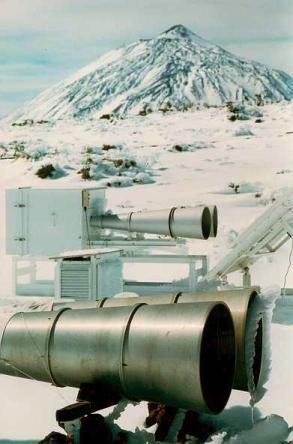 Tenerife radiometers used a switch frequency of 63 Hz, but even so there existed long term drifts on the scale of hours due to changes in temperature and the atmosphere. This was removed by using further switching by a mirror in front of the horns which moved every 8 seconds. Everything started in 1983 at the Nuffield Radio Astronomy Laboratories (now called the Jodrell Bank Observatory) of the University of Manchester, when it was thought that receivers existed which when incorporated into an instrument could reach the sensitivity requiered to detect fluctuations in the Cosmic Microwave Background (CMB). To carry out this, the experiment would have to work permamently and in a high altitude site with a dry stable atmosphere. Contact was made with the Instituto de Astrofísica de Canarias (IAC) which had shown that the Teide Observatory was a good site for infra-red observations. An agreement was arrived at and the first radiometer (10 GHz) was installed in 1984 and so was born the Tenerife Experiment. Over the years, two more radiometers arrived at the Observatory, one operating at 15GHz and another one at 33GHz. These new instruments were scaled copies of the old 10GHz radiometer according to their observing wavelength, in order to obtain the same response on sky: three fields of 5 degrees across, separated by 8 degrees. In the final analysis of the data, all frequencies were neccesary, so we decided to consider all instruments as a single experiment. Three frequencies are requiered to confirm the origin of any detected signal on the sky. If the signal appears in the three instruments with the same amplitude, then it should correspond to the thermal perturbations of the Cosmic Microwave Background. This was the case in 1994, when a common signal between the three channels was detected, with a temperature of 30 microKelvins, or one part in 100.000 in the amplitude of 3 K (-273 C) of the background radiation. A galactic signal should have an amplitude ten times larger in the 10 GHz instrument than in the 33GHz one.